If you’re going to ask me “Why Maldives?”, I’ll tell you I’m not really sure. I think part of it is that I was influenced by the thousands who yearn of setting foot in this country in South Asia. Maldives? It’s every Filipino’s dream! (Apart from Europe, that is.) 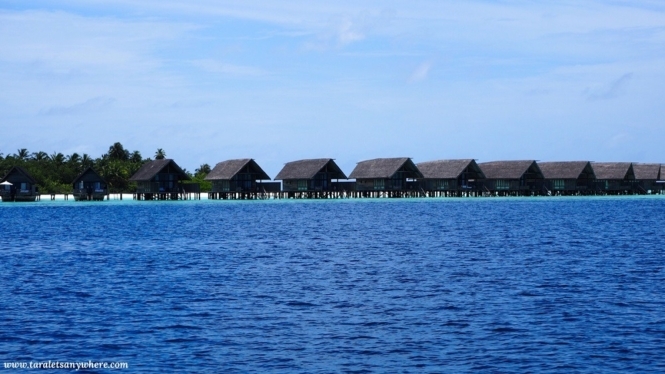 Another reason is the country’s own pull, a mix of exclusivity and urgency — a place where you can sleep in water bungalows, 5-star luxury resorts and which specific areas are in danger of sinking in decades’ time due to global warming. Regardless, I did want to go here. This 2018, I wanted to do something for my birthday week (for a change) and decided on spending it in Maldives. Incidentally, this is also my first solo international trip, discounting my going to work in Malaysia. And so here’s my solo birthday trip to this dream country. Prior to the trip, I was a nervous wreck. I wondered about the things that may go wrong. I double-checked the ferry and boat schedules, brought twice my estimated budget, repeatedly confirm all info to my hosts in Airbnb. Anyway, the thing with travel is that things are bound to happen no matter how much you prepare. In my first day, I arrived in the airport and went directly to Gulhi Island. There, I found that I’d been scammed with the Airbnb host I’d booked and already paid for. On a day trip to a private resort. The day before my trip, I was still in contact with my Airbnb host. He confirmed my booking, the snorkeling trip I’d reserved and which (according to him) I would be sharing with other guests in the inn. He said he wasn’t around but he had already talked to his staff to take care of me. In hindsight, red flag #1 is that he didn’t ask me if I would like the staff to fetch me from the jetty on arrival — something every other host is doing. When I arrived, I got lost a little bit. I asked locals for directions and they looked at me funny. Red flag #2. I assumed it’s because I was a solo female traveler, and honestly I had my fair share of curious looks. Eventually, a guy approached me to say the inn I was looking for had already been closed for several weeks (about 2 months if I remember correctly). I was dubious at first, so we still headed to the inn and lo and behold, it was locked and abandoned. No, this isn’t the end of the story yet, and I don’t want to give a bad impression of Maldives based on this solitary experience. Please continue. The local guy led me to other inns in the island. 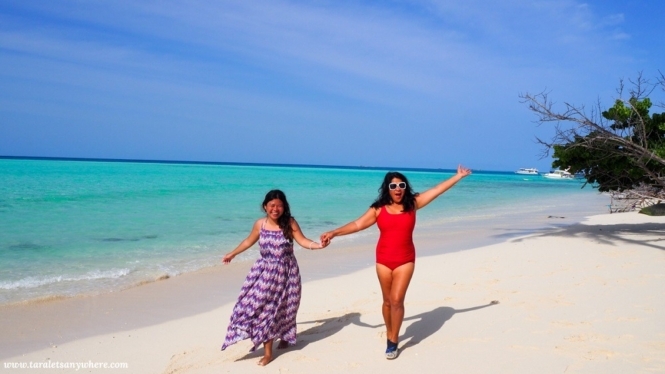 I have to tell you that Gulhi Island is really small and you can explore it on foot in just a few minutes, and as such there are only a handful of accommodations there. All of them were fully booked and “Sorry, we can’t do anything.” Some pity looks. I considered my options. (1) Beg for a local to let me crash the night, (2) wait for the public boat to Maafushi Island in the late afternoon, where there are more options for stay, or (3) rent a speedboat now and pay $100 or so. Just as I had given up, we found a guesthouse with an available room. It turned out to be a blessing in disguise. My host Samad (Silver Shade Guesthouse) was warm and accommodating. He took me snorkeling in the coral reefs nearby. I didn’t have a life vest on and to be honest I had never snorkeled without one, so he guided me along the way. He showed me a part of the beach where there are baby sharks. That night, he invited me to break fast with him and the staff — this was during Ramadan. I was touched. I skipped the snorkeling trip I’d planned the next day and stayed in the island, practicing my laps. I was alone for the most part, in a beautiful beach. 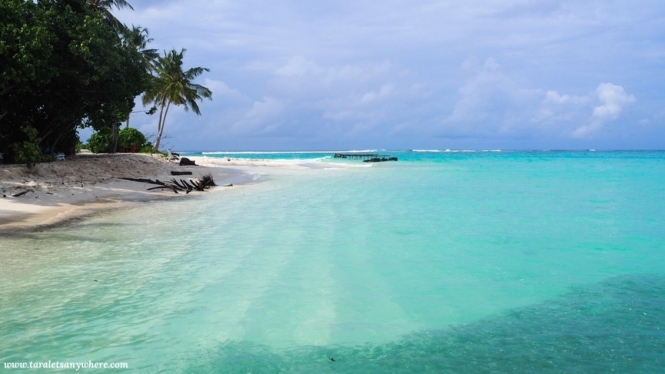 Gulhi Island is a small island near Male, popular for those who prefer to get away from the crowd. Note: Airbnb replied to me on the same day and offered a refund. I’m a big Airbnb fan and I believe this is a rare incident. What I wasn’t happy about is that, even with my complaint, the said listing was never taken down. If anyone is curious, the listing in question is Apex Inn with Ahmed as host (superhost, actually). My host at Gulhi Island (Samad of Silver Shade Guesthouse) is extremely friendly and helpful, and the same goes for my host in Fulidhoo Island (Bushree of Galaxy Sunrise, who informed me that I am his first guest ever). There was a personal touch to their service. I was slightly embarrassed — in a good way — because I wasn’t used to being treated as such. In both occasions, I was invited to dinners and other activities. There were casual discussions about life, traveling, their home country and the challenges of keeping a business in this current era. I don’t mean to sound sappy, I realized one of the things I like about blogging is how we can show appreciation by promoting the places we love, the things we love, and the service of great people to other travelers who are looking for authentic experiences as we do. It’s like we are destined to meet these people. I’m used to solo traveling and I’m proud of it. But it’s not the only reason I often go out alone. I’m an introvert and I get along with selected people only. Somehow, I felt that the universe humored me (“That’s what you want, is it?”) and so in my previous travels I didn’t meet new friends on the road, even though admittedly there were times I wish there are others I could talk to or have social drinks at night. 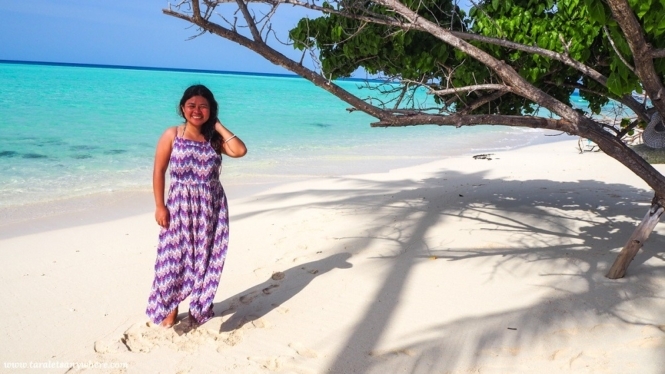 While in Maafushi Island, I met two groups of Filipinos who were in the same speedboat. You know how last time I’d declared I will now allow things to come to me? I told myself it’s time I allow myself to be friends with other travelers. So when I met the guys again in the late afternoon, I opened up myself and I came with them to have dinner in the beachside and one or two drinks in the Floating Bar. With Tita Juvy, a fellow Filipino visiting in Maldives. It was all fun and lovely, and I know from now on I won’t be averse to meeting others when I’m off globetrotting alone. So, Maldives… What’s the verdict? 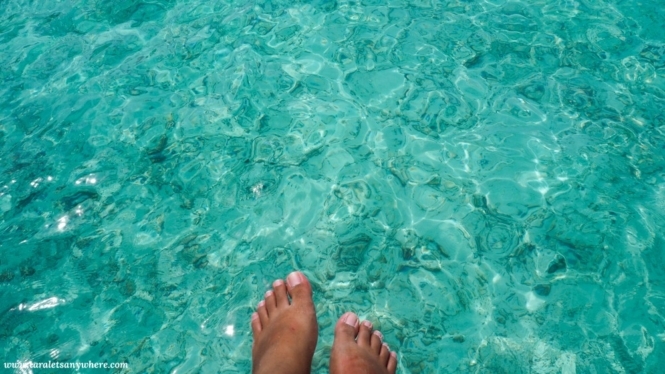 I liked my birthday vacation in Maldives, even if I was not completely swept off my feet — I’ve lived in the Philippines, you see, with my own fair share of white-sand beaches. Even so, the scenery here is unique and the blue of the surrounding is really one of a kind. 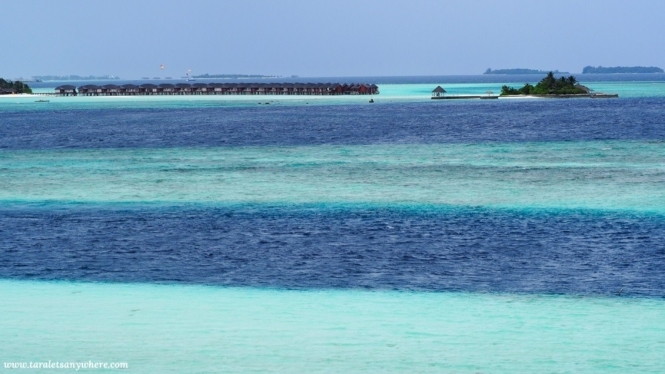 You’d be hard pressed to find other places on Earth with water as blue as that in Maldives. Also, as I’ve mentioned, the locals make this country alive. 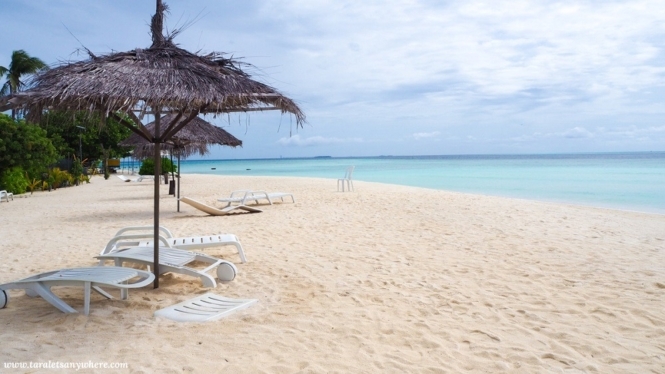 It’s a bit tricky to see the best of Maldives when you’re on a budget. You have to spend your money wisely, get a budget accommodation for instance so you can go on snorkeling trips or resort excursions. The photos you see online — the water villas, private white-sand beaches with lazy chairs, are most often than not those of private resorts and you’ll be missing out a lot if you skip them. Even a day trip on one will do. One of the many private resorts in MAldives. With those said, it was well suited for me. 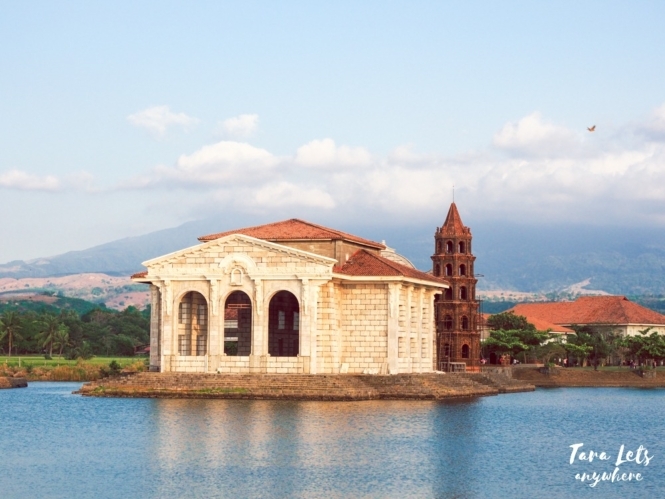 It has a mix of everything — the quiet, the flurry of activities in more touristy local islands, the relaxing views, the presence of other Filipinos vacationing whom you can chat and hang out with. I had the option to do what I wanted, depending on my mood. And let’s be honest here, is it possible to not like Maldives? P.S. Going to Maldives soon? Always wanted to visit this amazing place and the beautiful beaches. Unfortunate you got scammed. Hopefully not everything/everyone is like that in Maldives.